So I guess Tuesday is the new Monday in my little world. I’m terribly sorry this post didn’t go out yesterday as planned, but Travis needed my help with a project, and thanks to the fuzzy head this cold has given me, it took me all day to do, what really should have been only an hour or two’s worth of work. But I’m here today to get this series started! Are you ready to jump in with me? 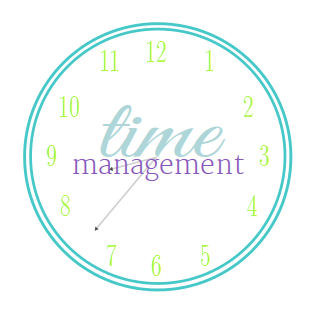 There is a wealth of material and resources out there covering the time management topic. Which makes sense, with busy lives and changing schedules, it’s a skill I’m sure many people look to tweak and change as their needs do. I decided early on, that it was going to be oh so easy to get off track and put off decisions if I let myself wander the wonderful world wide web, my local books stores, and our local libraries. I’m researching and reading, don’t get me wrong, but I’m not letting myself stagnate because of it. I decided to take a similar approach to organizing my time as I would when organizing a room or space. The first step for me, is to analyze and make lists. 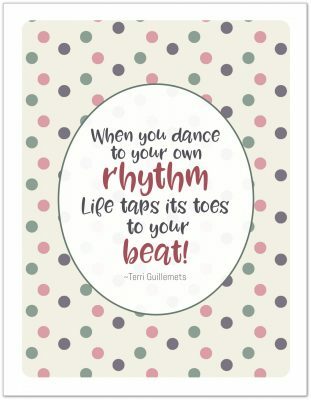 Time is a little more tricky than a room, but I think the steps I’m going to be taking will help me craft a routine that works well for me. And that, my dear friends, is the first key. I’m focusing on my routine only, not the family routine, not the boy’s routine, mine! Because when I’m off I throw everyone else off. I’m pretty sure I’m looking at this with open eyes. I know some things are going to get worse before I get to the end, but I’m hoping that by the time Canada Day (July 1st) rolls around, I’ve got my groove down. That will give me the whole summer to tweak the other routines as/if needed. So where does one begin? With a list of course! I’m not talking about any old list either, I’m talking about a massive list; I’m talking about THE list! When I first sat down to think this through, I thought of a ton of different ways to do this, and I scribble a ton of different lists. In the end, I realized I can’t really schedule anything in until I know what it is I need to do. So I created the following printable to help me out. Pretty basic, I know. I actually find this kind of scary, because I know once I start I might just end up filling that page, I might even need a second one. I’m prepared to be overwhelmed, which is why this is step one, and it’s all I’m going to think about for right now. Here’s what you do with this. (You might want to steep a cup of tea, or pour a glass of wine, or whatever your favourite beverage might be, this could take a little bit of time) First thing first, print out a copy or two of the printable, or just use whatever scrap paper you have lying around. I plan to keep this list, so I’m going to use my printable. What I want you to do is to think about everything you typically do in a normal day and a normal week. Only those two time frames. This is a list of all the things you do that keep your world spinning, and on track. Include everything you think of with the exception of things that are not part of the normal rhythm. If you only grocery shop every two weeks, don’t include it. If you only dust your blinds once a month, don’t put that on this list. This list is for, well, every day, every week things. Now isn’t the time to worry about what things you feel you should be doing, but aren’t. Right now, we’re starting with the things you have to do to keep life running smoothly. Don’t forget to put down time for yourself, because nothing can mess us the rhythm of day to day life than when we get weary and worn out. Do you take one night to slip into a bubble bath and soak the stresses away? Write that down! Do you spend time each day crafting, reading or on some other hobby? Write that down! Those are just as important as anything else, you need to make time for them. Don’t worry about the other stuff that falls outside the every day or every week categories. I promise we’ll get to that a little later in this series. For now, the every day little things are enough to get started. We don’t want to bog ourselves down before we’ve begun. 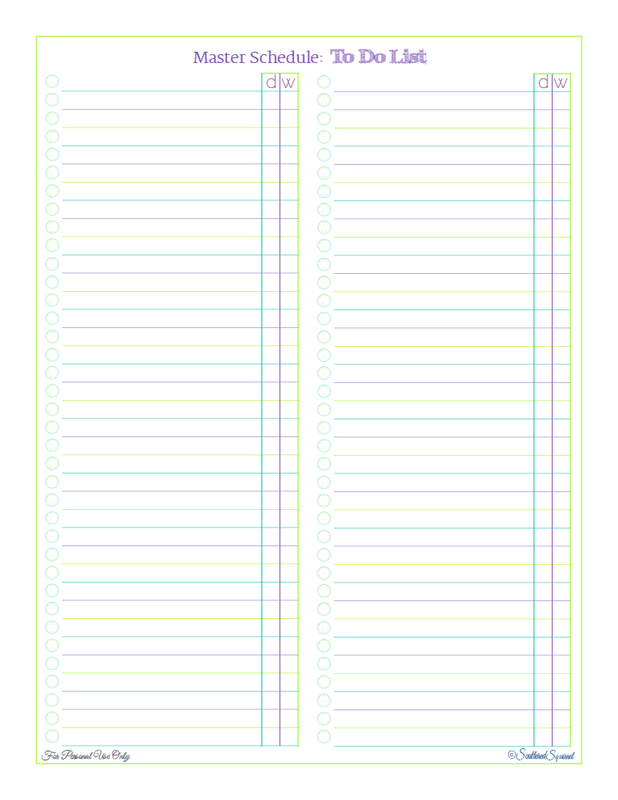 As you jot down items, or after you’ve finished making your list, add a check mark in the “d” (for daily) or “w” (for weekly) column. Those little marks will come in handy on later on. Tomorrow I’m sharing my list, and the next step, so I hope you’ll come back. For right now though, I’m off to go hit up the polls and do my civic duty, with fingers crossed that our lovely province (BC) ends up with a leader who will take care of it and us! (Well, one can always hope!) Until tomorrow, I hope you all are having a great day! When it comes to making up your schedule, do you block out time for things that are just for you? Or, are you like me, and have a hard time taking any time for yourself? Any other British Columbians out there? Have you voted already?